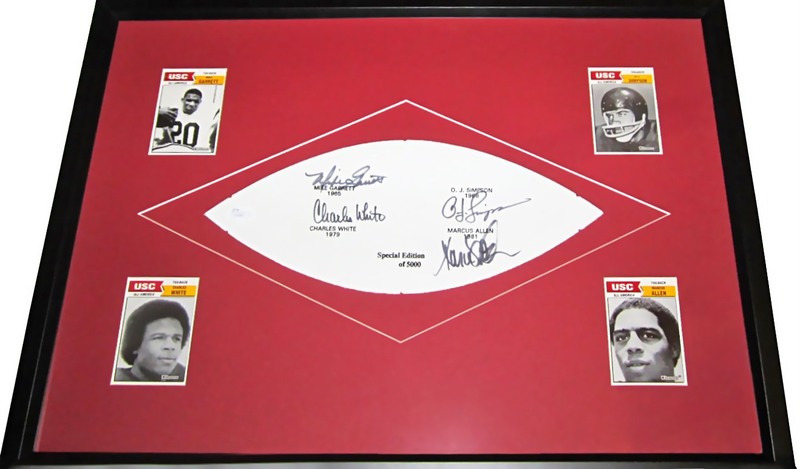 White leather football panel autographed in black marker by USC Trojans Heisman Trophy winning running backs Marcus Allen, Mike Garrett, O.J. Simpson and Charles White, professionally matted in USC cardinal red and framed with original USC trading cards of each player in black wood, ready to hang. Authenticated by JSA with their matching numbered sticker on the panel and certificate of authenticity card. Framed size is 17 by 24 inches. ONLY ONE AVAILABLE FOR SALE.